My husband and I just returned from a fantastic ten day adventure in Peru. Peru is a wonderful country for outdoor enthusiasts of all types! There is surfing, mountaineering, rock climbing, mountain biking, and much more. And it is extremely affordable! 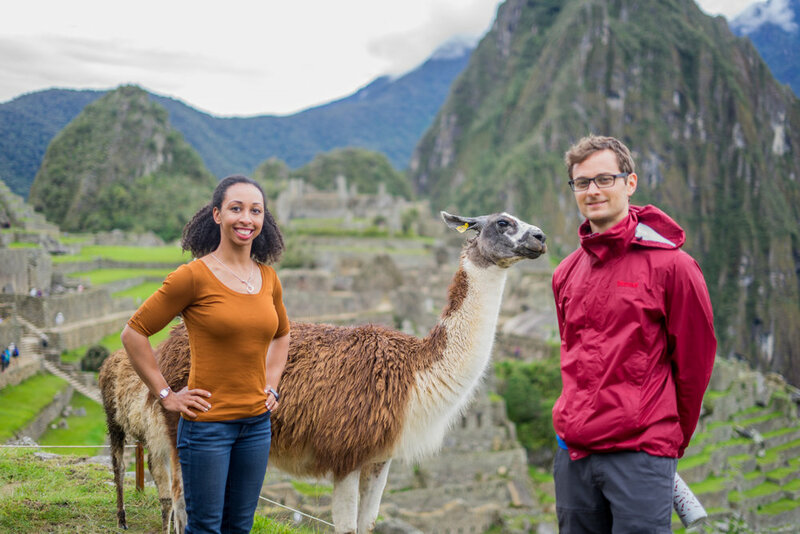 My husband really wanted to see Macchu Picchu, and as a climbing addict and animal-lover, I mainly wanted to climb and pet as many alpacas and llamas as possible. For those of you who are interested in visiting Peru, I’ll share our experiences to hopefully make your trip planning smoother. We split our time between Lima and Cusco. Lima is located on the Pacific coast and is the capital of Peru. It's a a bustling metropolis of over ten million people. Cusco is located high in the Andes Mountains in the center of what was the Inca Empire and is considered the cultural capital of Peru. This review will focus on the climbing in those areas. I managed to visit three different gyms! Two in Lima and one in Cusco. Google told me there were two gyms in Lima, although one local climber told me there was a third near the airport. Most tourists stay in a neighborhood called Miraflores. It is filled with stores, casinos, restaurants and great views of the coast, and is safe to walk around at night! In the middle of Miraflores is a gym called PIRQA. PIRQA is advertised as a sport climbing gym, so as a boulderer, I was hesitant to make a trip out there. But boy was it worth it. The gym was small compared to gyms in the US, but was the largest and most expensive of the three I visited. A single day pass was 40 soles, about 12 dollars. There were two different bouldering areas. One with a horizontal roof and another with vertical to overhanging walls. There were about 30-40 different boulder problems ranging from V0-12. The problems were marked with tape and each hold was marked with a right angle, like a finish hold in the US. I was very confused at first because I thought every hold was a finish!! They also have a semi complicated volume rule. Volumes are on for feet if there is no tape on the volume, but you can only smear, no actual holds can be used. If there is tape on the volume, then you can smear and use any holds on that volume. The landing mats completely covered the climbing area and were very thick. Overall, the setting was very good, and the grading was comparable to outside climbing. The training area was fantastic and included multiple hangboards and wooden ledges as thin as 5 mm. TRX abs and shoulder rehab bands were all available. An extra bonus is the upstairs restaurant that gives you a good view of the tall sport climbing walls and of the city. The Outdoor/Indoor Climbing Gym. A truly unique experience! One of the several hangboards available. Located in a less touristy Peruvian neighborhood is BaseCamp Peru, an indoor and outdoor gym that is a 2 dollar uber drive from Miraflores. A day pass costs 20 soles, about 6 dollars. The manager, Bruno, was extremely nice and even took us out to lunch where the locals eat. BaseCamp Peru has rope climbing and bouldering, with boulder problems ranging from V0 to V6. The route setting was similar to World Cup setting with running along holds and big dynos. Luckily for me, most of the routes could be done statically. There were plenty of pads, but some had to be pulled around to cover some gaps. There is a small training area with hangboards and campus rungs. Basecamp Peru did offer one thing that no other gym could….ninja training! Training for American Ninja Warrior while in Peru. 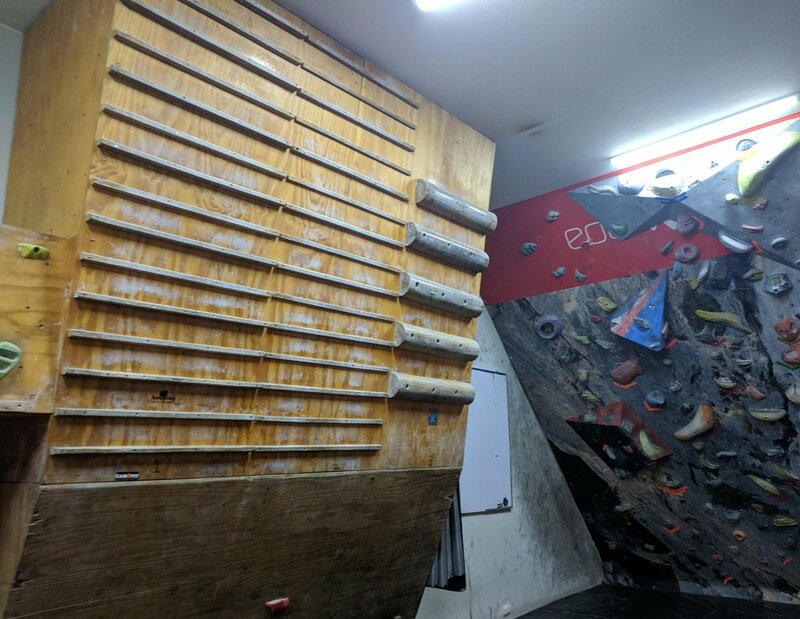 If you’re on your way to Macchu Picchu and want to get a quick climb in, 7a Escuela de Escalada is just the place for you. 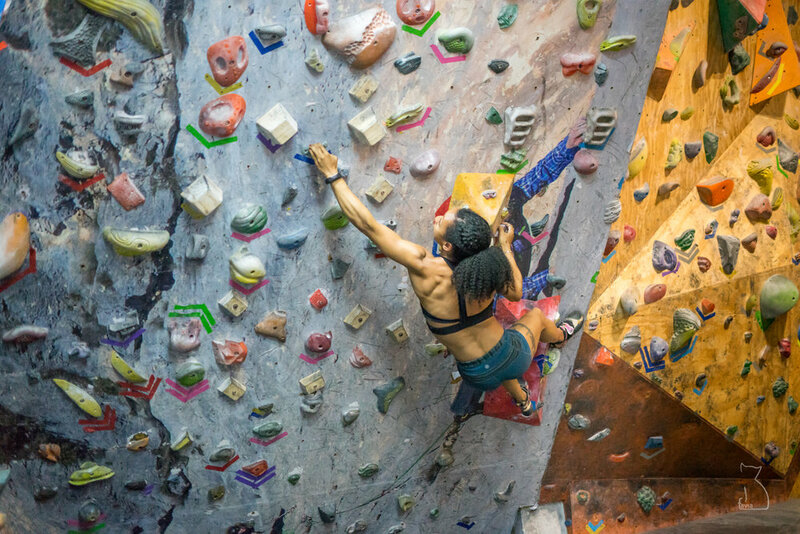 Located in the basement of an old sports arena that is currently used as a recreation and athletic complex in Cusco, 7a Escuela de Escalada is a bouldering only gym that is less than a dollar uber ride from the historic city center. A day pass here was the cheapest, coming in at 10 soles, about 3 dollars. The gym is much smaller than the other two, and the gym will close early if they are slow. There were about 20 boulder problems that ranged from V0 to V6. The setting was rather strange, reachy, and awkward. The mats were pretty thin, but there were extra thin pads to help with the fall. The training area was really small, with one hangboard that I couldn’t reach without stacking pads, TRX foot holds, and 3 campus rungs. 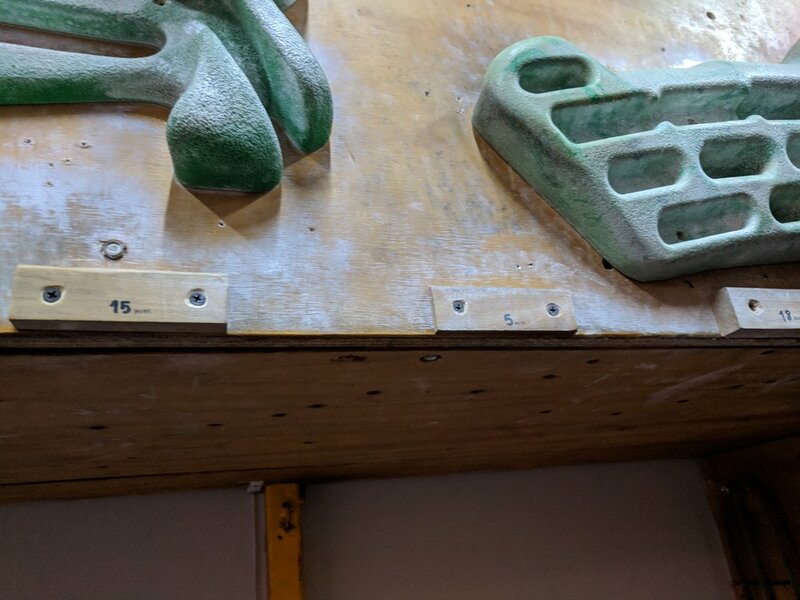 At this gym, you can rent crashpads and get directions to the local crags. There is accessible, quality bouldering around Cusco, but it can be difficult to find information online. Multiple online searches left me empty handed, so I took to Instagram using any hashtag I could think of….#peruclimbing, #cuscoclimbing #climbperu, #cuscobouldering, etc… Eventually, I found a picture of bouldering with the hashtag “los techos”. Next, I took to youtube and found some AMAZING videos of roof climbing (not surprising since los techos translates to ceiling or roof). Now I was really stoked on finding these boulders, all I needed were directions. I tried sending poorly translated to the owners of videos, but no one responded. On rockclimbing.com, I was able to find vague directions in Spanish, and I was planning on using those to find the boulders. Luckily, when I was at 7a Escuela de Escalada, the Cusco bouldering gym, a worker told me about a guidebook through their website. Although still in Spanish, it had better directions and pictures of the rocks. Here is the link to the guidebook, https://7aescueladescalada.com/topos-cusco/los-techos/ (download available at bottom of page). Once you find the boulders, get ready to have a FABULOUS time! There is definitely something for everyone here. Slab, traverses, highballs, lowballs, and my favorite, roofs! I warmed up on a pumpy V1+ traverse that was in the shape of an arc. The highest point was in the middle and the end of the problem is very close to the ground. Next, I did a really fun V5 that involved back stepping and drop knees! So much great movement. The final problem I tried was a loooong V10 with a very difficult start, fun horizontal roof in the middle and vertical climbing. I would recommend a crash pad for this one! The end is rather high! I went during the rainy season, and a torrential downpour had occurred just hours before I arrived at Los Techos, so I could only climb the roof. Checkout my website, traversegirl.com for more pics of the climbing and detailed directions from the parking area to the boulders. If travelling in the dry season, you will need to book your permit several (six is suggested) months ahead of time. We travelled during the rainy season, so we only needed to book one month ahead. You can get two passes for Machhu Picchu, a morning ticket or an afternoon ticket. I highly recommend, you go in the morning because only the morning ticket allows you the opportunity to go on extra hikes. You can choose between Huayna Picchu and Machu Picchu Mountain, and they also have two start times (early and late morning). We chose to do Huayna Picchu, which offered amazing views of the Incan ruins. We allowed a full day when traveling to Machu Picchu. We took a plane from Lima to Cusco. A cab from Cusco to Ollantaytambo and then a train on Inca Rail to Aguas Calientes. We stayed the night there and picked up our bus tickets for the next day. The bus stop closes at 9 pm , and buses in the morning run every 10 minutes to Machu Picchu, so you don’t have to worry about getting there at a specific time. When you arrive at Machu Picchu, there will be a ton of people offering English tours. Private tours go for between 45-50 dollars. Make sure you negotiate because they will start off higher! Ballestas Islands, Paracas is a 3 hour side trip from Lima. I was lured to come here with penguins, but we saw no penguins. There were a bunch of birds and sea lions, so if that’s your thing, make the trip. Otherwise, pick a different place to go. During this day trip, we did go to the slave tunnels in Chincha and this was by far the best part of the day. There are miles and miles of pitch black underground tunnels that still contain bones from dead slaves. A guide will walk with you through the tunnels telling you the horrific history of the area. Afterwards you can enjoy a drink at the fancy bar because the plantation is now an upscale hotel. We used Uber to travel around Lima and Cusco. It was super duper cheap and the cars were much safer than other cabs.